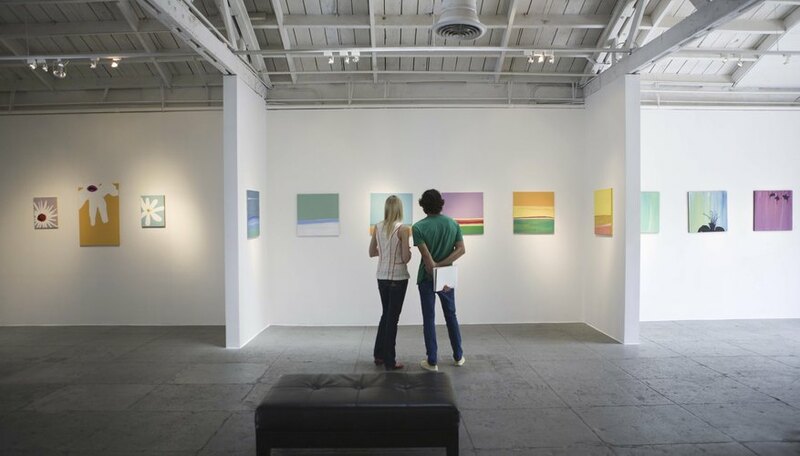 Art gallery tags, which are also known as title cards, information labels and exhibition labels, are labels affixed next to displayed artwork. A title card identifies the artist, the title of the artwork, the year it was produced, and the medium and dimensions of the artwork. Custom-made title cards can be ordered through printing companies but they also can be made easily and economically at home using simple tools and materials. Use a word processing software, such as Microsoft Word, to print the following information on white card stock paper: artist's name, title of the artwork in italics, year the artwork was made, medium, dimensions of the artwork in U.S. standard units and metric units, and the price if the artwork is for sale. Align each piece of information to the left, with a line space in between. Cut out the title card using a straightedge and X-Acto knife, leaving plenty of margin space around the text. Use a t-square or right angle ruler to make sure the corners of the title cards are 90 degree angles. Cut the black foam board the same dimensions as the title cards using a ruler and X-Acto knife. Again, use a t-square or right angle ruler to make sure the corners of the foam board backing are 90 degree angles. Spray adhesive to the back of the title card. Adhere the title card to the cut foam board and allow the adhesive to dry. Place sticky tack on the back of the exhibition label and affix it to the gallery wall. Position the label at the bottom right hand lower corner of the art. To ensure the title cards do not distract from the artwork on display, limit the size of the title cards to the size of standard business cards or slightly larger, and use a font and text size that are plain and are easy to read. To ensure consistency and present a professional exhibition, use the same fonts, layouts and card stock for each of the title cards, and display them at the same height and in the same place next to each work on display. It is standard for hung art to be centered on a point approximately 60 inches from the floor. Because the text on the titles cards is usually small, do not place the labels too low or too far from the 60-inch center point. An X-Acto knife is very sharp; take extra care when handling it. Based in Chicago, Harriette Marchonde has been writing professionally since 1997, including 12 years of technical writing experience. She has covered sports, food and drink, travel, design, family, health and education. Marchonde holds a Bachelor of Science in molecular and cellular biology.